Fast forward a couple of decades; we now have music delivered on digital media that can reproduce lower frequencies than vinyl ever could, genres that are dependent upon bowel-loosening low end, and a general ethos that “more is better.” Recording engineers start wiring up NS10 woofers (because there should ALWAYS be spares kicking around in case the assistant blows another one up…) in reverse and using them as microphones instead of speakers and putting them in front of bass drums. When listened to on their own the signal from the speaker may not sound like much of interest, but when blended with another more traditional mic on the drum, magic can happen. 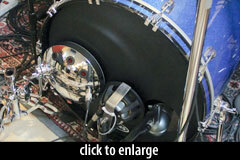 Yamaha has been selling their now-discontinued Subkick since the mid-2000s and this put a pretty face (shell?) on the concept; a 6.5'' speaker mounted in a 10'' drum shell and mounted in front of a kick drum, under a floor tom, or on a bass cabinet using the included tom arm/snare stand base. Moon Mics‘ Dave Gaynier started experimenting with a similar configuration 10 years ago and through much refining developed what is today’s DK27, currently Moon Mics’ singular product. Utilizing an 8'' diaphragm with a mesh grille cloth or, optionally, a contoured steel grille (the review model was fitted with this) and a sleek, chromed cap, the Moon Mic (“MM” from here) mounts with a choice of three tom brackets (Pearl, Yamaha, or Gibraltar) that accept similarly branded tom mounts that then are held by the bottom tube/legs of a snare stand. There’s an XLR jack for the 250Ω output (passive so no phantom power is necessary) and also a polarity switch which is a nice touch, especially if using the MM live and the console isn’t equipped with them on the input channels. 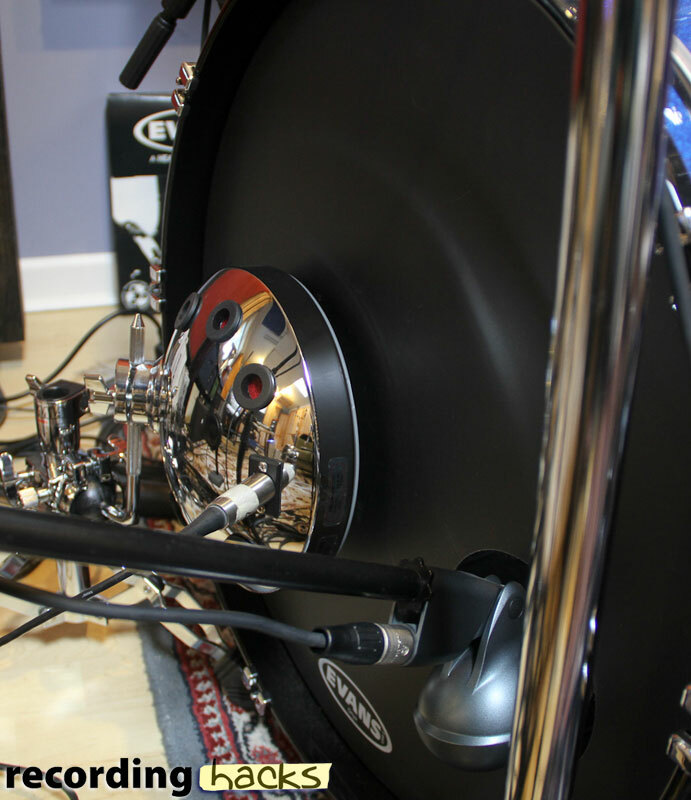 The MM is considerably lighter than the SubKick and, because of the shallower depth of the housing, can be easier to position in front of a drum that’s surrounded by a forest of stands. The chrome cap, which also has five holes on the surface to help vent pressure from the movement of the diaphragm giving it even more of a “cratered” moon-like appearance, is VERY shiny. The MM could be your lighting directors best friend or worst enemy — perhaps there should be a “Dark Side of the Moon Mic” option for those that want the audio effect but don’t need it to be the most vibrant thing on stage (leave that for the lead singers…). The stated frequency response of the MM is 20Hz–15kHz; I don’t know if this is a -3dB down measurement, but I can tell you that the MM definitely captures those low frequencies with aplomb! I tried the MM in front of my 22'' Ludwig Classic maple kick drum along with a homemade version that I’ve been using for a couple of years that consists of 6'' Morel driver mounted on a short mic stand; I also borrowed a Yamaha SubKick to test the MM against the original. I also had my usual Shure Beta 52A in the port of the resonant head on the drum allowing me to blend the low-frequency units with a more traditional microphone. 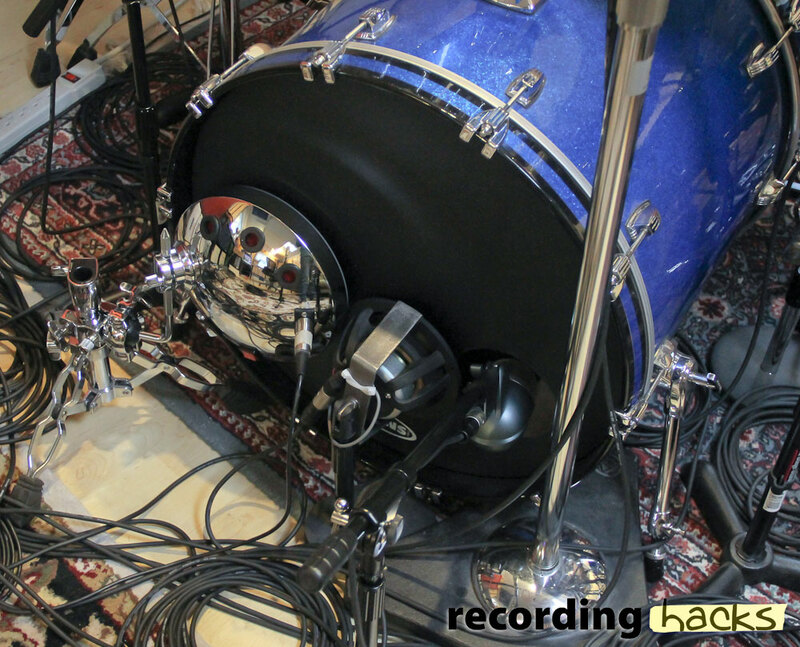 MM claims that their product can be used as the only mic on the drum, but in my tests at different locations on and distances from the front head of the drum, I wasn’t able to ever get a sound that I felt covered all of the sound of the kick. Neither of the other two sub-mics did either, so I don’t really chalk this up as a fault of the mic. The first thing I noticed when comparing the three mics was that my improvised “craft project” mic had a much higher resonant frequency; when viewed on a spectrogram, the Morel driver shows more energy in the 100–200Hz range and less below 80Hz than either the SubKick or MM. This is very apparent in the included “solo” examples for each mic. The MM and SubKick have a more pronounced and lower fundamental frequency which, when blended with my Beta 52A in the head port, gave the drum much more “weight.” My Morel driver sounded “flabby” in comparison. Ultimately, the proof of any microphone’s usefulness and value is how it works in a musical setting, and this is where I found the MM to shine. There’s a solidity to the tone it produced that enhanced the sound of the kick drum better than my homemade model and on par with the SubKick. It’s lighter and easier to position than the SubKick, so another tick in the pro column for the MM. I can’t fault it for it’s performance, so the only possible negatives for the MM are visual — if the “bling” is too distracting I could see this being an issue — and potentially the price. The MM ranges from $349–499 depending on the grille choice and hardware options; this could be viewed as excessive for a mic with a specialized use. That said, Moon Mics is a small operation with each mic made by Dave Gaynier in the US, and constructed to a very high standard; this certainly adds value, as does the ability to directly contact the company and even the man who built the product should there ever be an issue. 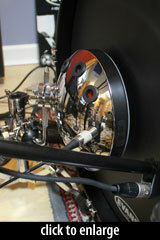 Color me impressed; I’ve enjoyed using the MM on my drums and definitely found it to enhance the sound of the kick drum. I don’t know that I’d use it on every session (an 18'' jazz kick tuned way up, for example), but when I need a larger-than-life sound to rumble the seats, the Moon Mic is definitely the ticket. Don Gunn is a recording and mixing engineer based in Seattle, WA. Visit him online at DonGunn.com or on Twitter at @don_k_gunn. Previously: The Best Voiceover Microphone … Ever? We use that all the time at the studio I’m interning at in Detroit its really great. I think that your self made one, sounds more natural, that others. Between those commersials, there was very little differences. And yes they were tighter, than your selfmade one, but were they better?!? More expensive, that´s for sure! Thank for making this comparison. What is the model number of the Morel driver, if I may ask? The Morel is an HU631 – I believe this is still a current model. How did you reverse wire your morel? 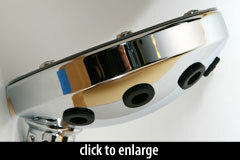 I’m looking to include something like this to go with the beta 52 I use on the drum kit at my church. Just wire the + terminal on the speaker to the ring of the 1/4″ jack and the – terminal to the tip of the jack and it will be reversed in polarity. You can also wire it normally and play with the polarity switch on your preamp – I still do this all the time depending on where I have the inside kick mic in the drum. 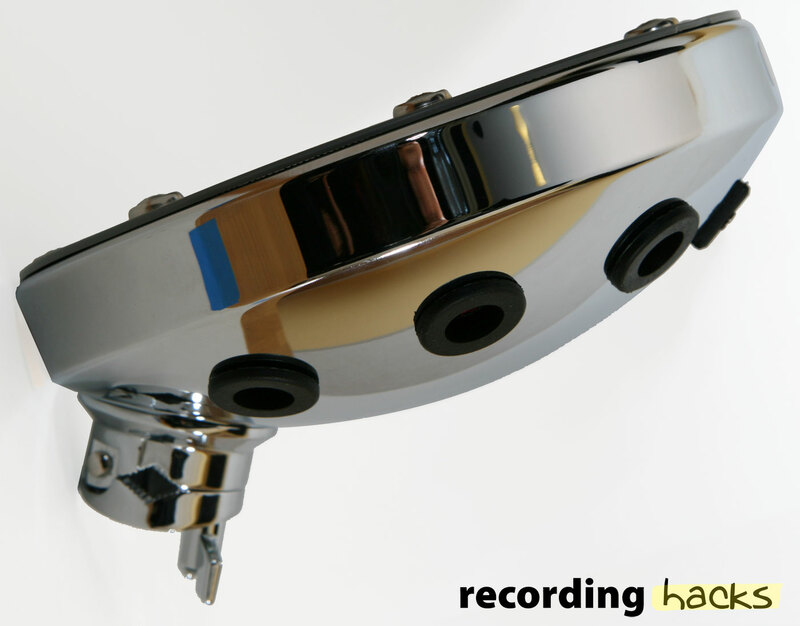 Wonder what this sounds like as a snare mic on the resonant head. If you can get it in phase with a top mic it might pick out a really nice sound.